The establishment of the Yoro Biological Corridor Initiative by the government of Honduras was officially announced by Ángel Matute, director of the National Institute for Forest Conservation Protected Areas and Wildlife (ICF), at an October 30th ceremony in the town of Morazán, Honduras. The Yoro Biological Corridor will cover thousands of square kilometers and will link three parks and a wildlife refuge and enhance the ecological integrity of these protected areas, protect the critical watersheds that serve the surrounding communities, and establish the foundation for sustainable livelihoods within the region. The biological corridor will be managed under a co-management agreement between ICF, the eleven municipalities within the corridor, the COMISUYL coffee cooperative and the Mesoamerican Development Institute (MDI). Management of the corridor will include the promotion of sustainable coffee production and processing methodologies developed by MDI and piloted at COMISUYL. Under this system coffee is produced with “Integrated Open Canopy” (IOC) coffee production in which forest patches of equivalent area to coffee plots are conserved, with the cost offset by sales of sequestered carbon. 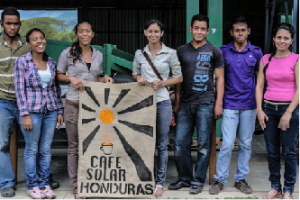 Coffee will be processed using industrial-scale solar-hybrid coffee driers that eliminate the use of fuelwood, which is conventionally used to dry coffee and has been identified as a key driver of deforestation. Solar driers also reduce coffee processing costs and add value to carbon sequestered in IOC forest patches. This region provides critical winter habitat for priority Neotropical migrant birds including wood thrushes and golden-winged warblers. These species breed in North America and have been the subject of extensive applied conservation research by Dr. David King of the US Forest Service Northern Research Station and colleagues, whose research has demonstrated these sustainable practices support migrant bird populations. 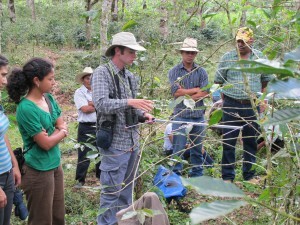 These practices are viewed by Honduran Conservationists as the last best hope for conserving the region’s dwindling forests, which are critically threatened by expansion of unsustainable coffee cultivation, and the authority vested through the co-management agreement will furnish a mechanism for establishing these and other sustainable practices at a regional scale. Refining and validating this system is the focus of a current interdisciplinary research program being led by Timothy Randhir of the University of Massachusetts Amherst and David King of the US Forest Service. The study is a joint effort between the US Forest Service Northern Research Station, the University of Massachusetts, the Mesoamerican Development Institute and the COMISUYL Coffee Cooperative. The objective of the study is to increase our understanding of habitat-specific abundance and survival of Wood Thrushes and Golden-winged Warblers, with the aim of integrating bird conservation into coffee production. UMass Researcher Brett Bailey demonstrates radio telemetry to coffee farmers Alan Manzanares and Fidel Bonilla (President of Cooperative COMISUYL). Also pictured to the left is fellow researcher Fabiola Rodriguez. The proposed Yoro Biological Corridor directly addresses the primary threat to Yoro’s national parks and provides the technology, training, education, and production methods to transform the agricultural landscape of the region to be in compliance with the Convention on Biodiversity, allowing for the preservation of local biodiversity through preservation and expansion of forest habitat. “The Yoro Model” describes a system of agro-industrial practices linked to high-biodiversity agroforestry systems, technological advances, empowerment of women, and socioeconomic structures that offer a market-based solution to rural poverty, employment and training of local youth, deforestation and degradation of water resources, and climate change. Specifically it consists of Integrated Open Canopy™ coffee farms in combination with off-grid, green processing factories powered by renewable energy, hybrid-solar supplemented with biofuel production and implemented and scaled-up through the vehicle of co-management agreements. The rural communities will directly supply developing international carbon and coffee markets. El Yoro Corredor Biológico propuesta se dirige directamente a la principal amenaza para los parques nacionales de Yoro y proporciona la tecnología, la formación, la educación y los métodos de producción para transformar el paisaje agrícola de la región para estar en conformidad con el Convenio sobre la Diversidad Biológica, teniendo en cuenta la conservación de locales la biodiversidad mediante la conservación y ampliación del hábitat forestal. “El Modelo Yoro,”describe un sistema de prácticas agroindustriales vinculadas a sistemas de alta biodiversidad agroforestales, los avances tecnológicos, el empoderamiento de las mujeres y las estructuras socioeconómicas que ofrecen una solución basada en el mercado a la pobreza rural, el empleo y la formación de los jóvenes de la localidad, la deforestación y la degradación de los recursos hídricos y el cambio climático. Concretamente consiste en fincas de café Dosel Abierto Integrado™ en combinación con energía renovable, híbrido solar complementado con la producción de biocombustibles y puesto en práctica y en marcha a escala a través del vehículo de los acuerdos de co-manejo. Las comunidades rurales se suministra directamente el desarrollo de los mercados internacionales de carbono y café.